NEW YORK — The Grammy Awards, airing live on Sunday, include predictable nominees like Beyonce and Taylor Swift, and awards like best rap song and best country album. But we take a look at interesting factoids in this year's nominations, including Joan Rivers battling Jimmy Carter for an award and Miley Cyrus earning her first-ever Grammy nomination. It's still surprising that Justin Timberlake's comeback album, "The 20/20 Experience," didn't earn a nomination for album of the year at last year's Grammys. The pop star was also shut out of the other major categories — including song and record of the year — and he opted out of attending the big show. But this year marks a redemption for the singer — sort of. Timberlake is nominated twice for the coveted album of the year award on Sunday, thanks to his guest vocals on "Brand New" from Pharrell's album "G I R L" and for co-producing "Partition" on Beyonce's self-titled release. Dust off that suit and tie, Mr. SexyBack! 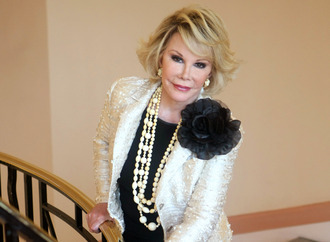 Joan Rivers, who died last year, is nominated for best spoken word album for "Diary of a Diva." It's the comedian's second Grammy nomination and first since 1983, when she competed for best comedy recording. Her competition includes actor James Franco, Massachusetts Sen. Elizabeth Warren, singer Gloria Gaynor and former President Jimmy Carter. Johnny Winter, the skilled blues guitarist who also died last year, is nominated for best blues album with "Step Back," which was released two months after he died. Yes, the former "Cosby Show" star is nominated for a Grammy Award. Jamal Warner is up for best traditional R&B performance for his spoken word portion on the song "Jesus Children" from the Grammy-winning Robert Glasper Experiment. The song also features Lalah Hathaway; its competition includes Anthony Hamilton, Marsha Ambrosius and Kem. Pharrell is his own worst enemy: The megaproducer-songwriter-singer-rapper-hat icon is nominated three times for album of the year, thanks to his own album "G I R L" and for his production work on Beyonce and Ed Sheeran's albums. Usher, too, will battle himself Sunday: His four nominations include two for best R&B performance with "Good Kisser" and his appearance on Chris Brown's "New Flame." Both tunes, which Usher co-wrote, are also nominated for best R&B song. He should probably take it "Nice & Slow" when releasing back-to-back music. The real race for album of the year is between Tom Coyne and Bob Ludwig. The engineers are both double nominees in the top category: Ludwig is the mastering engineer behind Pharrell's "G I R L" and Beck's "Morning Phase," while Coyne is part of the group of mastering engineers who worked on Smith and Beyonce's No. 1 albums. When Miley Cyrus didn't earn any Grammy nominations last year despite having big hits with "Wrecking Ball" and "We Can't Stop," she didn't attend the show. Instead, she posted videos of herself playing video games while Pharrell and Daft Punk cleaned house. This year, Cyrus has reason to twerk (or celebrate like a normal woman): Her album "Bangerz," which includes those songs, is nominated for best pop vocal album. It wasn't released in time for last year's awards, but voters still cared to recognise Cyrus' work. Her competition includes Katy Perry, Coldplay, Ariana Grande, Ed Sheeran and Sam Smith. On second thought, she might as well stay home. Part of earning Grammy nominations comes from knowing how to work the system. For instance, though U2's "Song of Innocence" was not innocent when it popped up on your iPhone and was released for sale two weeks after the Grammy eligibility, the band quietly released its vinyl version in time to be considered for nomination. Now, it's up for best rock album. If you were surprised — or unhappy — that Pharrell's "Happy" wasn't nominated for song or record of the year, that's because it originally came out in mid-2013. Pharrell submitted a live version of the track, but voters weren't convinced and it didn't earn a nomination for a top prize. The live rendition is up for best pop solo performance — where it will compete with a live version of John Legend's "All of Me," another No. 1 hit that qualified for last year's Grammys. Is Christina Aguilera a V.I.P or a plus-one? The pop singer is nominated for best pop duo/group performance for "Say Something" with A Great Big World. She was nominated for the same award in 2012 for "Moves Like Jagger" with Maroon 5. Her last solo Grammy nomination was back in 2008 (we won't count her nomination for the "Burlesque" soundtrack in 2012). Her stance on the Billboard chart is similar: Her latest Top 10 hits include those Grammy-nominated songs as well as Pitbull's "Feel This Moment," despite releasing two solo albums in the last five years. Because of release dates, most songs nominated for Oscars will compete at the following Grammy Awards. For Glen Campbell, it's all happening at the same time. The country music icon's "I'm Not Gonna Miss You" is nominated for best original song at the Feb. 22 Academy Awards as well as best country song and song written for a visual media at Sunday's Grammys, where he will go head-to-head with "Frozen." It might as well "Let It Go."